My wife and I moved from Colorado to Florida for various reasons. But in the process, we also freed up capital to invest, because we paid substantially less for our condo than what we got for our house in Colorado. Recently, we’ve considered moving to a cheaper town where we can buy a house for just half of what our condo cost. We would also lower our monthly expenses. You see, there are two ways to cash in big-time by downsizing. Let’s dig deeper into this idea, starting with the concept of financially strategic home buying. You need a place to live, and owning can make sense. It often costs less to own than to rent, and with a fixed-rate mortgage, your payments will not rise over the years, as rental rates tend to do. Then, when your home is paid off, you’ll be able to live on the cheap… maybe (we’ll get back to this). But if you have a free-and-clear home that constitutes most of your financial net worth, you’ll be living in your money rather than investing it. A simple question makes this clear: Would your future be more financially secure if you had a home worth $400,000 and nothing saved or if you had a home worth $200,000 and another $200,000 wisely invested for a decent return? Obviously the financial size of the home you choose can matter as much as the square footage, but that doesn’t mean you have to sacrifice too much. After all, you might find a home just as big and nice for half the price if you choose a less-expensive part of town or move to another city. Or you could buy a fixer-upper and improve it slowly over time in order to get what you want for much less. But what if you already own your home? Ah, now we’re getting to the exciting part. Why not sell it and buy something that costs less? Having financially downsized our home (the condo was the same square footage as our previous house), we were able to buy another condo as an investment. We planned to rent it out but ended up selling it for a profit instead. We then loaned out some money to an investor (with real estate collateral, of course) for a good interest rate. The profits we made on these investments were possible because we hadn’t tied all our money up in a home. 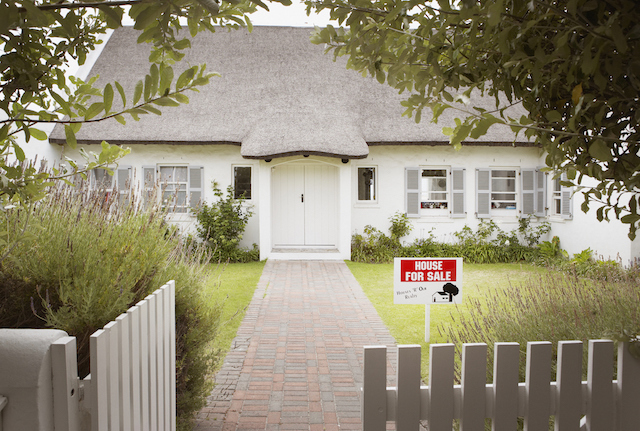 Houses are referred to as investments, but they usually have expenses with no income — and betting on rising prices to increase your equity is speculation more than investment. Over the long run, rising home values don’t even beat inflation. Condos in our complex are currently selling for less than half of what they sold for nine years ago. Besides, if you sell your home for twice as much as you paid but buy another for the same amount, you haven’t yet profited, have you? You have the same total assets minus all the costs of selling and buying. And even when home prices are appreciating, there might be better ways to profit than putting all your money in one piece of real estate. For example, you could sell your house and buy two cheaper ones with the money — live in one and rent out the other. You’ll have all the same gains from appreciation over the years plus investment income along the way — something you don’t normally get from your home. This is the second reason my wife and I have considered downsizing again: to lower our monthly expenses. We have condo dues that would be eliminated by owning a house instead, but in any case you’ll usually reduce expenses when you buy something cheaper. Insurance, property taxes and mortgage loans all go up with the price of a home. If you buy a physically smaller house, you might also save on utilities and maintenance. Put those two reasons together and you’ll see just how powerful this downsizing strategy can be. You simultaneously free up capital to invest for more income and free up hundreds of dollars monthly that used to go to housing expenses. This isn’t about saving or making money for its own sake, unless you’re that kind of person (some are). The more important point is that you might have values, dreams, and goals other than owning the most expensive house you can afford. A home matters, but perhaps you also want to travel, be financially secure later in life, put the kids through college, start a charity or climb Mount Everest. Having less money eaten up every month by your home, and having more capital to invest, can make all of these things possible. Maybe you’re renting at the moment, but who knows what the future will bring? The U.S. Census Bureau says people average almost a dozen moves in their lives. One of the moves you make might be to a house of your own, and everything here is applicable even if you are looking to buy for the first time. Suppose you buy a home for $240,000 with a $40,000 down payment. A 30-year loan at 4.5% will run you $1,013 per month. Other expenses (taxes, insurance, mortgage insurance, utilities, and maintenance) might be another $800 per month, for a total housing cost of about $1,800 a month. What if, instead, you put that $40,000 toward a smaller house that still has what you need but costs just $120,000? You’ll pay less for utilities, property taxes, insurance, maintenance, and mortgage insurance (usually not required when a loan is less than 80% of the home value). The loan will cost $405 per month and the other expenses might be $400 or so, for a total of about $800 a month. By choosing a smaller house, you’ll have $1,000 less going out every month. Run that figure through an investment return calculator and you’ll discover that if you invested $1,000 every month and got a 7% average return, in 30 years you would have $1.2 million in your investment account. That’s the power of investing your money instead of living in it. Perhaps you would prefer to spend an extra $6,000 per year traveling or eating out every other night and invest the rest to have about $600,000 in that account 30 years from now. The possibilities are endless. Downsizing isn’t just for retirees who no longer want to care for a big house and yard (although that’s another nice advantage). And buying a low-priced home to start with isn’t about settling for less. In fact, owning a home that is financially smaller is a great way to have more of anything else you want out of life. Your Turn: Have you considered downsizing your home? If you have done so already, we’d love to hear about your experiences — did it work out well for you? What was the biggest challenge?